In yesterday's reports we mentioned the misadventures of the Burundi players - specifically the Women's team and board two from the Open team - who were absent at the start of play for Round 6. Today there were no 'normal' zero tolerance losses, as Chief Arbiter Takis Nikolopoulos created a grace period by making a series of announcements at the end of the countdown. However, there were missing persons. The players from Burundi who missed the sixth round were again nowhere to be found at the start of play. The organizers are investigating. One of the recent announcements was that the organizers of the Qatar Masters Open 2014 will be drawing 10 'golden tickets' to the event during the Olympiad. Men rated over 2300 and women over 2200 can enter at a table at the player exit. Five men rated above 2300 and 5 women over 2200 will get entry to the Qatar Open 2014, free accommodation with full board in a 5-star hotel (25th November to 5th December) plus air tickets provided by the organizers! Norwegian state broadcasters NRK requested and received a shuffling of tables in order to get the pairings they wanted on camera today. This meant a surprising change of geography in the top section of the playing hall, and I spotted one of the Chinese women arriving and automatically sitting down at the wrong, but usual table. The table one Open match, between sole leaders Azerbaijan and Cuba, had been moved to the edge of the top playing area, and the Russia-China women's clash was shifted into the center, where there is room between the boards for cameras. So today's live national TV coverage focused on Norway's top teams and the top Women's duel, with the Open event relegated to occasional checks - demonstrating that Norwegian audiences want maximum drama, and are not biased to expect this from the “men's” event. China was involved in the early drama of Round 7. 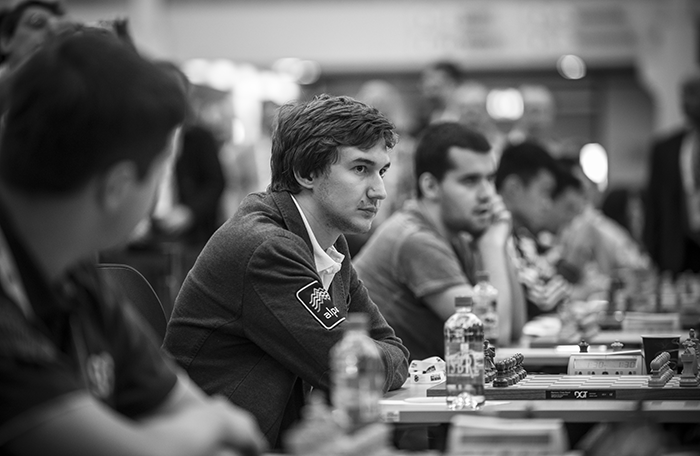 In the Open section, leader Liren Ding delivered an early and violent knockout against Serbian board one Milos Petrunovic. Not long afterwards they doubled their lead when prodigy Yi Wei beat A Indjic on board four. In the crunch women's match, China's number one, Yifan Hou lost the exchange early against Russia's recent acquisition, Kateryna Lagno, and despite reacting resourcefully, did not appear to have full compensation. Cuba have managed to work their way to the top of the table without attracting much attention, but GM Lenier Dominguez Perez changed all that by setting off a large amount of beautiful sacrificial fireworks in the face of Azeri number one Shakhriyar Mamedyarov. The Cuban world number 11 landed a left, then a right, and a knockout blow in a truly spectacular combinational finish. The Iranian women took an early lead against the other surprise performer of the event, with WGM Sarasadat Khademalsharieh winning on board two against Indonesian WGM Medina Aulia. This could be a key result as the Indonesians are higher rated on the top two, but lower on three and four - though the teams are very evenly matched. The 19th seeded Indian team has had a good start to the Tromsø 2014 Olympiad - their top four boards are all overperforming - and going into Round 7 they were in 14th place. But on a day where the reporting team has been looking at the halftime statistics, we wondered - how strong could India have been? If they were reinforced with their top missing players - former world champion Vishy Anand and current world number 26 Pendyala Harikrishna - India's average for their top four rated players would be 2706 - and make them the fourth seeds. and some suggested reading on the topic.